Hey, even LatinoFoodie needs a break from the kitchen time to time and the new menu from Olive Garden offered great variety and value. Just as Italian cuisine has its iconic dishes, like lasagna and spaghetti, the very popular Italian restaurant Olive Garden has a couple iconic dishes of its own: the bottomless warm and chewy garlic breadsticks and the endless house Italian salad. Well, hold on to your breadsticks folks because Olive Garden has announced the most significant change in the restaurants menu in its history. The restaurant has unveiled over 20 new menu items, that include a range in variety and value, showcasing new ingredients and cooking techniques that raise the bar on flavor for casual dining. 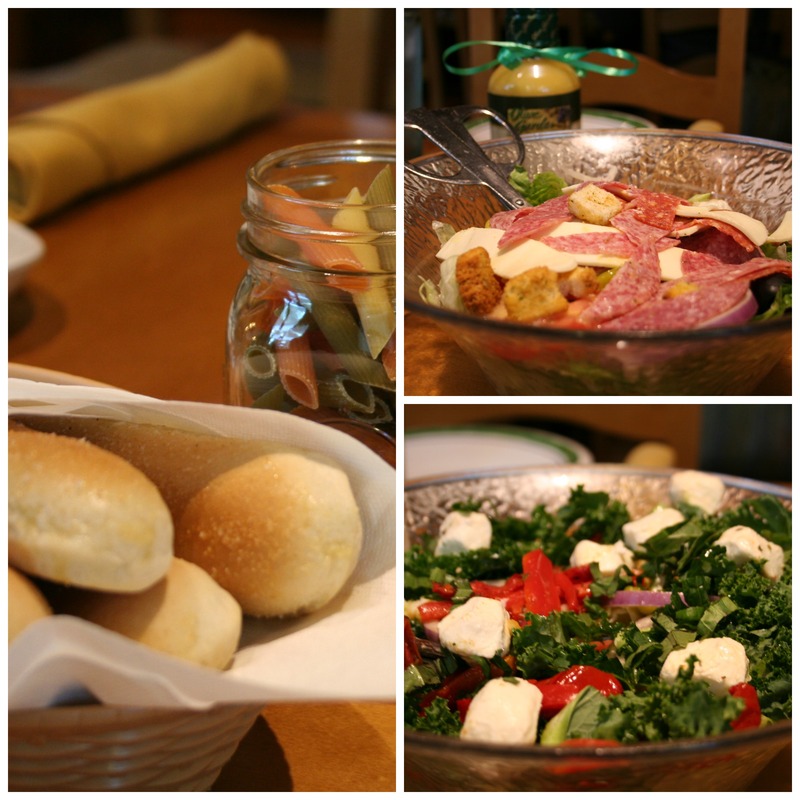 Don’t worry, the breadsticks will not change and while their famous salad also stays, it is being upgraded with Olive Garden’s new Salad Toppers to enhance your salad grazing pleasure. The Anitpasti Italian Meats & Cheese is a generous topping of hard salami, genoa salami, pepperoni, and mozzarella cheese. The Roasted Tomato Caprese is full of fresh mozzarella bites, smoky roasted tomatoes, bell peppers, basil and raw kale, drizzled with extra-virgin olive oil. As always, extra Olive Garden Italian dressing and a blanket of grated parmesan cheese is always optional, but who says “no” to that? Olive Garden has expanded the Tastes of Italy section to include eight small plate dishes for guests who want to explore different flavors. The Parmesan Olive Fritta is a bite-sized blend of olives and Italian cheeses, rolled together and lightly fried. 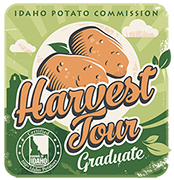 You also get your choice of citrus aioli or creamy gorgonzola dipping sauce. 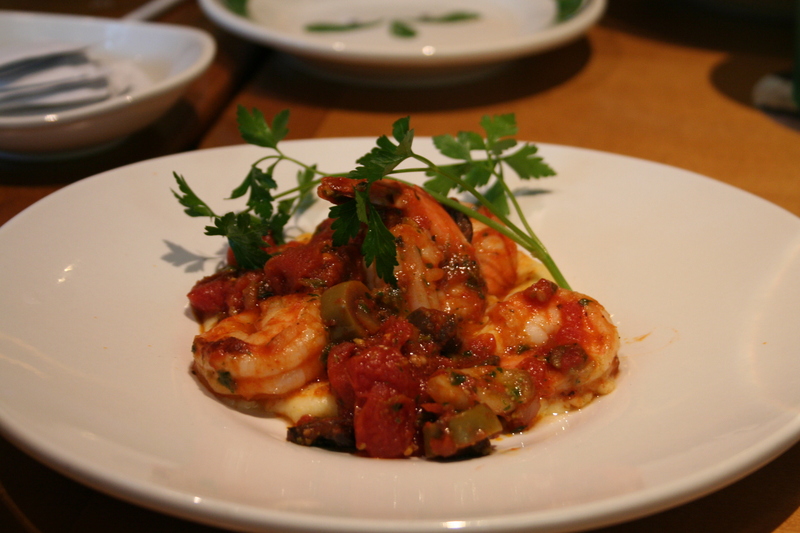 My favorite new small plate is Polenta Shrimp alla Greca, sautéed shrimp served on creamy polenta and topped with a fresh blend of olives, capers and tomato sauce. Universally known as the king of appetizers, Olive Garden now has their own Spicy Calabrian Wings: unbreaded wings tossed garlic and Calabrian chili peppers, served with that creamy gorgonzola dipping sauce. 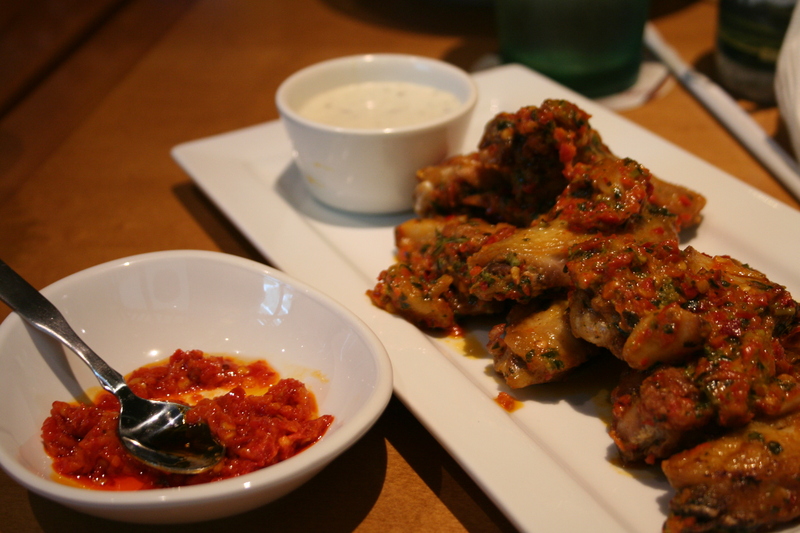 If the heat from these juicy wings is not enough simply ask for a side of their signature Calabrian chili paste. Olive Garden also has lighter menu offerings with a variety of dishes coming in at under 575 calories. Calorie counting just got easier (and tastier) with two new menu items: Center Cut Filet Mignon and Chicken Abruzzi. The filet mignon is 6 ounces of premium cut filet that is seasoned with Italian herbs and grilled, served with sautéed Italian vegetables and roasted garlic. 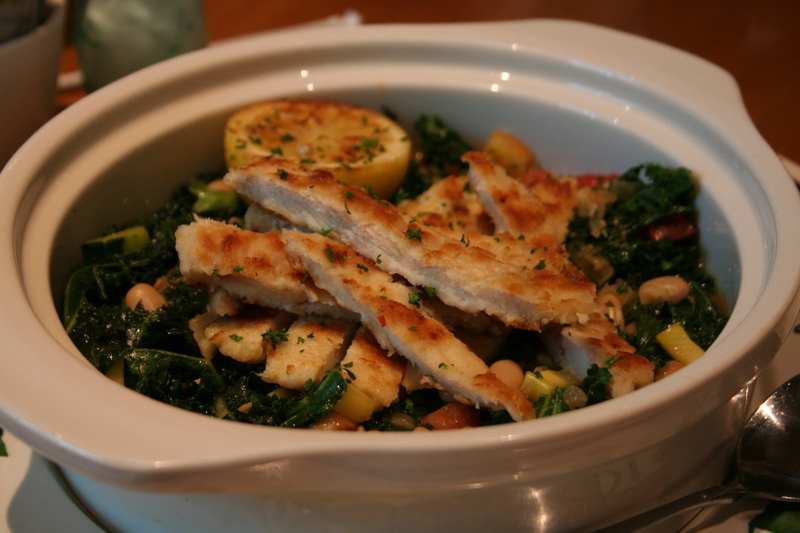 The Chicken Abruzzi (another one of my new favorites) is grilled chicken breast in a savory broth that is simmered with cannellini beans, kale, and vegetables. Just a squeeze of the grilled lemon into your Abruzzi and you are ready to enjoy your Mediterranean cruise, I mean, lunch. Olive Garden has enlivened the chicken and seafood sections of the menu with a new Piastra. Traditionally, a piastra is a flat griddle cooking stone used to cook food over a hot fire. These stones are usually made of granite to promote even cooking and produces more tender and juicier proteins. Menu offerings include Crab Topped Chicken, Salmon Bruschetta, Pappardelle Pescatore, and Mediterranean Grilled Trout. While I have sampled most of the new dishes, this is even too much for me! 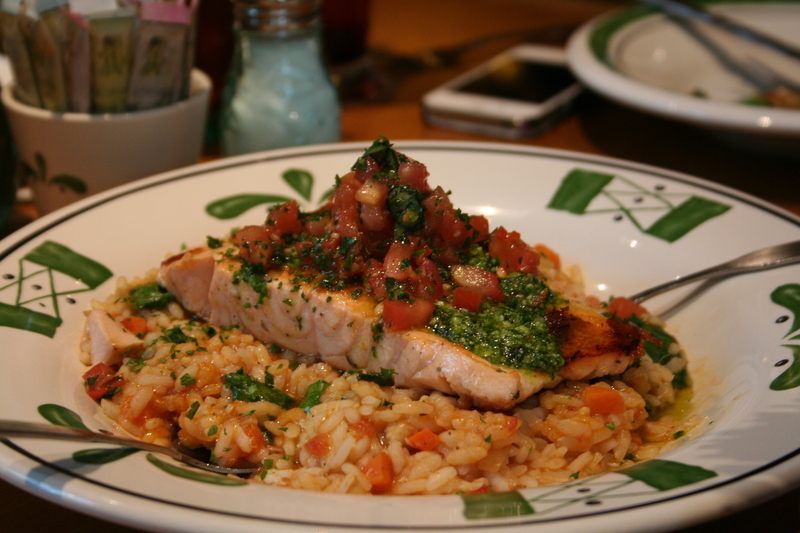 Of the new specialty entrées mentioned, I tried the Salmon Bruschetta, which is piastra grilled salmon fillet topped with tomatoes and basil pesto, served on a bed of seafood risotto with crab meat. Piastra heaven! And, the crab topped chicken is this incredibly moist pan-seared chicken breast topped with crab meat in a velvety tangy cream sauce. Olive Garden has kicked me in the face (and I liked it) with their new Salted Caramel Tiramisu. The layers of creamy caramel mousse and vanilla-soaked ladyfingers are topped with a salted caramel crumble and chocolate shavings. Blew. My. Mind. While no photo exists of my salted caramel blissdom, I’m telling you know to get a slice because it is available for a limited time only. Olive Garden also introduced “Cucina Mia,” a new menu section that gives guests the ability to create their own entrée from a field of six pastas and five sauces. All of these combinations are available for $9.99 every day. Pasta choices include: large paccheri, tri-colored vegetable penne, bucatini,cavatappo, linguine, and gluten-free rotini. Sauces include: creamy garlic asiago, primavera, spicy diavolo, fresh tomato pomodoro, and creamy sun-dreied tomato. And for an additional cost you can always topped off your Cucina Mia with chicken or sausage meatballs or sautéed shrimp.